Gavin Newsom: Either one of us. We gotta upack all of this. Betty Yee: We do have to unpack all this. And actually Commissioner Newsom, I took to heart – I think your guidance to all of us a few months ago and that is that we have to the stewards of fact with respect to how we move forward. And uh these are not easy issues. I have uh um – I did take time to visit Diablo Canyon Power Plant, and uh had an opportunity to really understand the operation and to meet some of the employees. Uh and first I just have to say um hats off to you for forty years of reliable service, and professional service. It is something that we don’t applaud – frankly – uh, in terms of how we – where we come since the plant was first constructed. That I was struck by how safety is by far the foremost concern in that facility from every aspect of the operation – to every conversation that I had with every employee on that site. It all had to do with safety and reliability. And what I want to say about the CEQA issue is this – uh – you know I think we live in times where were just surrounded by a lot of uncertainty. And I do think we’ve heard a lot of speculation. I’m not sure that I’m comfortable that I’ve heard a lot of facts. Uh – my own sense of the authority that this Commission can exercise independently is that – uh – the uh – the uh facts are not there. And frankly I feel like if they were there we would have grabbed onto them already. And so – uh – I know we live in dangerous times with respect to seismic risks. This is a different world with respect to being susceptible to terrorism and acts of terrorism. But we also have – um – I think a responsibility here to balance all of these different interests and needs. And – uh – yeah with respect to the issue of the marine life and um what we can expect if um the Commission decides to approve these leases – uh – I do want to say that you know a lot of work has actually been done at this State Water Resources Control Board with respect to mitigation measures – um to ensure compliance with the Once Through Cooling Policy – and uh – I think – um – if this Commission is prepared to approve the leases – I would like to direct staff to um – just call on the Water Resources Control Board to remind them that we do want them to um fully implement those mitigation measures to ensure compliance. These are not new requirements – these have been established – uh – I think people are familiar with what they are – all parties are familiar with what they are – but this is about – um – really – all state agencies – all hands on deck to be sure that we’re moving forward responsibly. And there are going to be a lot of agencies – state and federal and local involved – uh – in the transition – uh should this Commission approve the leases um to look at what will transpire over the next nine years. The other aspect I just want to comment about is that um – I really encourage PG&E and frankly all of the ah regulatory agencies and oversight agencies throughout this process to err on the side of more public input – um – I heard a lot of information today that frankly was shared uh really out of ignorance – and – there is a lot of misinformation going back and forth – this is not the time for that – and I think – uh – I just wanna get a commitment from PG&E that in terms of the public input process in the next thirty days that uh it will also include public education and really uh – having the patience to answer any and all questions with respect to what we’re really facing uh in this agreement that you have entered into with uh various parties of the environmental community. 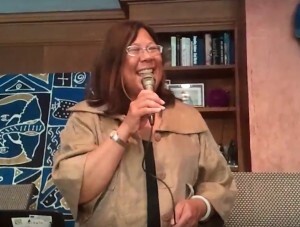 Betty Yee, Then candidate for California State Controller. October 8, 2014, Santa Monica, California. As worldwide headlines have proclaimed, California’s Pacific Gas & Electric (PG&E) says it will shut its giant Diablo Canyon reactors near San Luis Obispo, and that the power they’ve been producing will be replaced by renewable energy. On a global scale, in many important ways, this marks the highest profile step yet towards the death of U.S. nuclear power and a national transition to a Solartopian green-powered planet. 5 More U.S. Nukes to Close, Will Diablo Canyon Be Next? 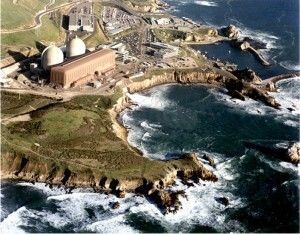 A rising tsunami of U.S. nuke shut-downs may soon include California’s infamous Diablo Canyon double reactors. But it depends on citizen action, including a statewide petition. Five U.S. reactor closures have been announced within the past month. A green regulatory decision on California’s environmental standards could push the number to seven. The focus is now on a critical June 28 California State Lands Commission meeting. Set for Sacramento, the hearing could help make the Golden State totally nuke free, ending the catastrophic radioactive and global warming impacts caused by these failing plants. A public simulcast of the Sacramento meeting is expected to gather a large crowd at the Morro Bay Community Center near the reactor site. The meeting starts at 10 a.m., but environmental groups will rally outside the community center starting at 9 a.m. The three State Lands Commissioners will decide whether to require a legally-mandated Environmental Impact Report under the California Environmental Quality Act (CEQA). 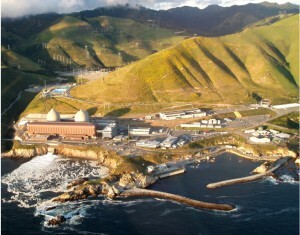 If ordered, a public scoping process will begin, allowing interested groups and individuals to weigh in on the environmental impacts of operation of two nuclear reactors on California’s fragile coastline. In 1969 and 1970 PG&E got state leases for tidewater acreage for Diablo’s cooling system. These leases are set to expire in 2018 and 2019. If the State Lands Commission does not renew them, both reactors will be forced to shut down. Signed in 1970 by then-Gov. Ronald Reagan, CEQA requires more extensive Environmental Impact Reports on such leases. Included among the issues to be evaluated are water quality, potential damage to human and other life forms, chemical and radiation releases, and impacts on threatened and endangered species. The commission will not decide whether Diablo will continue to operate, only whether it will now be required to meet CEQA standards. Pro-nukers say PG&E is at the brink of shutting Diablo’s reactors. They cannot economically compete with renewables or gas and are sustained by an intricate network of subsidies, liability protection and tax breaks. Many believe the cost of new environmental studies and of meeting updated standards would be a death blow. More protestors have been arrested at Diablo than any other American nuke, and the public pressure to finally shut it is intense. One of the commissioners is Gavin Newsom, California’s Lieutenant Governor, 2018’s leading gubernatorial candidate. Newsom said he sees no long-term future for Diablo. Another commissioner, state controller Betty Yee, is widely thought to favor the requirement. State finance director Michael Cohen is the third commissioner. He generally votes as instructed by Gov. Jerry Brown. Brown opposed Diablo early in his career, but has recently waffled. Among other things, Diablo dumps daily some 2.5 billion gallons of super-heated water into the ocean, killing vast quantities of marine life and worsening the global climate crisis. The project’s chemical runoff infamously killed millions of abalone years before it operated. Diablo may soon face regulatory challenges from other state and federal agencies that could, among other things, require cooling towers, at a cost of up to $14 billion. PG&E would then face a fierce public fight over who would pay for them. Diablo is surrounded by a dozen earthquake faults. It is half the distance from the San Andreas as was Fukushima from the shock that destroyed it. The Nuclear Regulatory Commission’s former resident inspector Dr. Michael Peck has warned Diablo might not survive a similar quake. Such a disaster would irradiate the Central Valley, which supplies much of the U.S. with its fruits, nuts and vegetables. It would send radioactive clouds into Los Angeles within about five hours, and across virtually the entire continental U.S. Closing Diablo would make California entirely nuke-free. Grassroots activists, with help from U.S. Sen. Barbara Boxer and Friends of the Earth, recently shut two big reactors at San Onofre, between Los Angeles and San Diego. They also closed plants at Rancho Seco (near Sacramento) and Humboldt Bay, and stopped proposed projects at Bodega and Bakersfield. Along with most nukes around the world, the only other remaining west coast reactor, WPPS2 on Washington’s Hanford military reservation, is also losing massive amounts of money. Because they can’t evenly compete with renewable energy or gas, a tsunami of shut-downs has swept away a dozen U.S. reactors since October, 2012. Dozens more teeter at the brink, including two at Indian Point, just north of Manhattan, and Ohio’s rapidly crumbling Davis-Besse reactor near Toledo. In Japan, more than 40 reactors remain shut despite intense government pressure to reopen them in the wake of the Fukushima catastrophe. Germany’s energiewende conversion to 100 percent renewables, which aims to shut all its reactors by 2022, is ahead of schedule and under budget. Much of the rest of Europe, including France, is now moving that way. Should California follow suit at Diablo, its conversion to a wholly green-powered economy would accelerate, likely leading Los Angeles to become the world’s first Solartopian megalopolis. Ironically, with citizen action, a big push in that direction could now come from a state commission’s decision to enforce environmental protections signed into law by California’s most pro-nuke governor. Harvey Wasserman’s SOLARTOPIA! OUR GREEN-POWERED EARTH is atwww.solartopia.org, along with his upcoming AMERICA AT THE BRINK OF REBIRTH: THE ORGANIC SPIRAL OF U.S. HISTORY. He has co-written six books on election protection with Bob Fitrakis (www.freepress.org), and was arrested at Diablo Canyon in 1984. The Iconic Peace Ship Golden Rule Is Hit by a Police Boat! he good ship Golden Rule is a miracle of the modern peace movement. In its iconic quest for global peace and ecological sanity, it has been re-floated, revived … and now hit by a police boat!!! The boat was first launched from a dock near Los Angeles in 1958 by Quaker activists intending to sail into the Marshall Islands to stop nuclear weapons testing. Among those present was the legendary singer John Raitt, star of the stage shows Carousel and Oklahoma, and leading man in the film Pajama Game. His daughter, multiple-Grammy-winner Bonnie Raitt, has carried on the tradition of No Nukes commitment throughout her stellar career. The 1950s Golden Rule crew of four were arrested before they could get into the test zone. One sailor for peace, Jim Peck, contracted tuberculosis while imprisoned in Honolulu. But their cause was picked up by another boat, the Hiroshima Phoenix, which did affect the testing. The entire effort contributed mightily to a global disarmament movement that won a lasting atmospheric test ban in 1963. Millions of living creatures (possibly including you) have been saved from death and disease by the halt in radioactive fallout from the US and USSR’s flood of bombs. 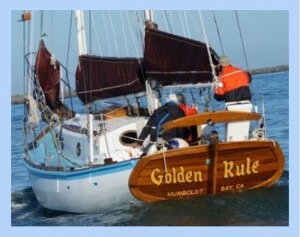 The Golden Rule subsequently sank in Humboldt Bay, California. But in 2010 it was rescued by Leroy Zerlang. A crew led by Chuck DeWitt of Veterans for Peace spent five years restoring her to seaworthiness, and the Golden Rule was relaunched on June 20, 2015. On June 8, 2016, the reborn Golden Rule sailed into Portland, Oregon, to “greet” Fleet Week – an annual maritime invasion of US and Canadian warships meant to put on a public display of military might. This year the warships include a PT boat and numerous other armed vessels. On Thursday, June 9, the Golden Rule set sail around 1:00 p.m. to travel up the Willamette River. The drizzle was steady. The purpose was to show our colors for peace amidst the fleet week warships. With the ship moving by motor power, the crew unfurled large red sails featuring its peace sign and the Veterans for Peace logo. Through the gray, chilly chop, the ship sailed peacefully around the men of war. There was no intent to stage a blockade or to do civil disobedience. In the steady rain, podcasting via cell phone from the ship’s deck, the “Solartopia Green Power & Wellness Show” was wet but sustainable. It featured activists Helen Jaccard and Mimi German, who discussed the ship’s history and the movement in the northwest to shut the WPPS2 nuclear power plant, the region’s last operating commercial reactor, which is losing tens of millions of dollars per year. Finally, while preparing to sail back to dock, the Golden Rule idled behind a drawbridge, waiting for it to rise. Suddenly a Washington County patrol boat with a two-man crew came along our starboard side. The Golden Rule had been peacefully boarded at least once during the day, and there was extensive, cordial communication between us and various police patrols. But while inexplicably floating right next to the Golden Rule, the Washington County boat suddenly gunned its engine. Neither its lights nor sirens were on. As it turned sharply away, the sharp corner of its rear smacked into the hull of the Golden Rule, about a yard directly below my feet. Standing directly above the point where the police boat’s tail smacked into our hull, it wasn’t clear to me what the two officers meant to do, or why they had sailed in choppy waters to sit within just a few feet of us. The officer in the back of the boat in stood in clear view about fifty feet from me. He showed no emotion when his boat hit the Golden Rule. I could not see the driver. Meanwhile, the ship will be sailing throughout the West Coast promoting the cause of peace. Some 58 years after its maiden voyage, this legendary little boat is once again at center stage in the global struggle against the nuclear madness. In a nation bristling with atomic weapons and reactors, where innocent civilians are regularly gunned down en masse, this graceful vessel represents an ark of civility, nonviolence and hope. Six decades after it first helped stop a bomb-testing program that spewed deadly radiation throughout the atmosphere and threatened all life on Earth, the Golden Rule is back to say that peace is possible … and essential to our survival. Harvey Wasserman’s America at the Brink of Rebirth: The Organic Spiral of Us History can be had via www.solartopia.org. The Strip & Flip Selection of 2016: Five Jim Crows & Electronic Election Theft, co-written with Bob Fitrakis, is at www.freepress.org.